Seafood Sampler Meal. You'll want to dive right into this spectacular two meal seafood sampler. The Seafood Sampler features the ever popular Stuffed Sole Suite, and tasty Marinated Salmon Platter. Each meal is ready in minutes so they're perfect when you need something quick and delicious. Two meals, each meal serves 4. �Thaw in refrigerator.Remove fillets from plastic wrap. Bake: Preheat oven to 400 �F. Place salmon fillets on a foil lined baking sheet. Bake for 10 to 12 minutes. 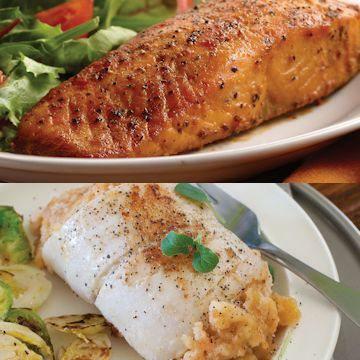 Grill: Grill salmon fillets over medium heat 4 to 5 minutes per side. Microwave:Place salmon fillets in a microwave safe dish. Cover with plastic wrap, venting one corner. Microwave on high 3 to 4 minutes, rotating halfway through cooking. Do Not Thaw! OVEN: Preheat oven to 375 �F. Remove plastic and place desired number of portions in a baking dish. Add approximately 2 TBSP. of water in bottom of Pan to prevent splattering and burning. Bake uncovered, for approximately 30 to 40 minutes. For additional flavor, use wine as a substitute for water. MICROWAVE (1100-WATT): Remove plastic and place two frozen portions in an appropriate dish. Add 2 TBSP of water to dish. Cover with plastic wrap, venting one corner. Cook on high for approximately 5 �minutes. Ingredients: Sole Fillets, Water, Partially Hydrogenated Soybean Oil, Enriched Bleached Wheat Flour (Flour, Niacin, Iron, Thiamine Mononitrate, Riboflavin, Folic Acid), Scallops, Crabmeat, Skim Milk Powder, Canola Oil and Hydrogenated Canola Oil, Corn Starch, Salt, Cooked Seafood (Lobster, Clams, Shrimp, Crab), Sugar, Vinegar, Soybean Oil, Shortening, Aged Cheddar Cheese (Pasteurized Milk and/or Whole Milk Protein Concentrate, Salt, Cheese Culture, Enzyme), Hydrolyzed Soy Protein, Butter (Butterfat, Water, Curd, Annatto), Yeast, Leavening, (Sodium Bicarbonate), Whey, Maltodextrin, Flavoring (Shrimp, Fish, Thyme, Oleoresin Spice Extract), Buttermilk, Lemon Juice Concentrate, Onion Powder, Modified Tapioca Starch, Spices, Dill, Artificial Butter Flavor, Natural Butter Flavor, Caramel, Yeast Nutrients (Calcium Carbonate, Ammonium Chloride, Calcium Sulfate), Spice Extractives, Dough Conditioners (Ascorbic Acid, L-Cysteine Monohydrochloride, Azodicarbonamide), Sodium Phosphate, Mono-Diglyceride, Sodium Benzoate, Natural Color (Beta Carotene, Annatto, Turmeric), Lemon Oil, Vitamin A Palmitate, Vitamin D. Contains: Fish (Sole), Soybean, Wheat, Shellfish (Scallops, Crab, Lobster, Clams and Shrimp) and Milk. ​Ingredients: Sugar Snap Peas, Carrots, Cauliflower, Fire Roasted Red Peppers, Fire Roasted Green Peppers, Fire Roasted Yellow Peppers, Butter (Cream, Salt), Extra Virgin Olive Oil, Water, Salt, Spices, Dried Lemon Juice (Maltodextrin, Natural Flavors (Lemon Juice Solids)), Dehydrated Parsley. Contains: Milk.